We're proud to have bred or exhibited dogs in AKC, CKC, ASCA and UKC obedience. 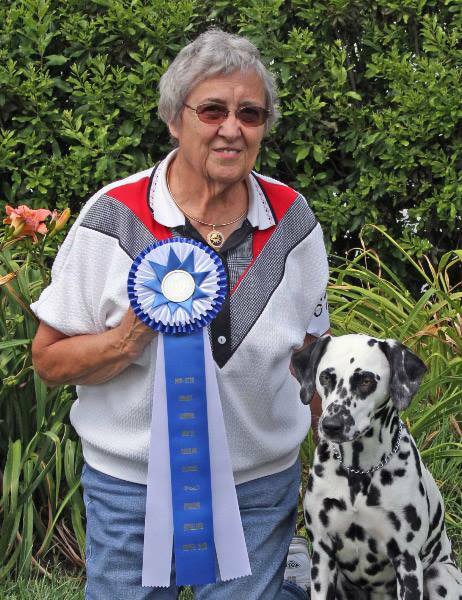 Woodwynd Dalmatians have earned obedience titles at all levels. We're exceptionally proud of Tease (Woodwynd High Tea at Crossroads UD AXJ OA RD) who earned her CD in 3 shows with a 195.5 average (and a High in Trial at the DCA National Specialty), her CDX in 3 shows with a 194.5 average, her UD in 4 shows with a 192.5 average and a UDX leg the next time out. Tease is now a multiple High In Trial winner! At the 2013 AKC Obedience Invitational, we were honored to see Tease place 4th in the Utility class!